If the story that DC Comics's Justice League: Trinity War ended up being had been the story that readers had been expecting, I might consider it a passable, amusing first meeting between the three Justice League teams. Unfortunately, the build-up and denouement of Trinity War so significantly differ from one another that it's hard to see what might otherwise have been a satisfactory story as anything other than a disappointment. And it's too bad, that. Every reader -- and I make that broad statement unequivocally -- went into Trinity War expecting that it would reveal the truth about Pandora, the mysterious figure who "caused" the New 52 relaunch in-story in Flashpoint and who appeared in every New 52 #1 issue, and about her fellow Trinity of Sin. While Trinity War does broaden Pandora's background somewhat, her role in Flashpoint and the reason she's been dogging DC's heroes is touched on not at all. Moreover, Trinity War's big reveal is that Pandora's box is not the mythical artifact we believed it to be (despite, inexplicably, that anyone who touches it "goes rogue" for a brief amount of time) but rather an Earth 3 Mother Box that brings to our world the Crime Syndicate. As such, nearly none of the build-up of Pandora matters to the end of Trinity War; this includes the three issues of the Pandora series that see her fighting evil wraiths supposedly released from the box but whose origins are ultimately left completely unexplained. Said wraiths appear nowhere in the Justice League, America, and Dark issues also collected here, such to underscore just how tertiary Pandora, the series and the character, is to this book. Were Pandora a character who had simply cameoed in the Justice League titles for a bit ahead of this inter-title crossover, none of this would be an issue. Two examples of relatively "big" Justice League stories come to mind -- the 1990s Justice League "Judgment Day" crossover and the 2000s conclusion of Grant Morrison's JLA with World War III -- each of which upended the Justice League status quo and each of which had villains who had been teased for a bit in just the affected books leading up to that point. But, in neither case was the audience lead to believe that the bad guys were anything more than a catalyst for the character development and other changes in the stories. The Pandora situation could be likened to all the cameo appearances the Monitor made in 1980s DC titles prior to the Crisis on Infinite Earths series and reboot, only the Monitor factored specifically into Crisis's resolution and Pandora, with the same kinds of appearances, not at all. Moreover the entire Trinity of Sin makes a fairly poor showing in Trinity War, despite that the book opens with their origin in the Free Comic Book Day issue from a couple years back; the Phantom Stranger "dies" halfway through and never appears again, and the reader learns nearly nothing about the third leg of the stool, the new Question. All of this is a shame because for what it actually delivers, Trinity War is a fun, if not especially ground-breaking, inter-title crossover. 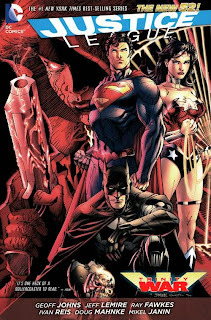 Between some early teases and how the story starts, it seems that Trinity War will pit the three Justice Leagues against each other in the angst-y style some might expect from the New 52. Instead, the Leaguers rally around each other, and around an injured Superman, relatively soon into the book. For those who miss some of the camaraderie between heroes found in the pre-Flashpoint DC Universe, aspects of Trinity War may feel like a heroic breath of fresh air. There's also a significant amount of the story that deals with DC's Big Three trinity, contrasting Superman's and Wonder Woman's moral codes, for instance, or Wonder Woman's belief in magic versus Batman's belief in science, all of which is enjoyable. These good character interactions help to mask what's ultimately a thin plot, which again wouldn't be such an issue except for the extent to which Trinity War had been hyped as a big deal. A lot of the story simply involves the various Leagues running around between a variety of locations -- Kahndaq, the ARGUS base, the House of Mystery, Belle Reve prison -- arguing with one another for a while, and then moving on to the next place. This is true for many crossovers of this type, but there's a significant amount of dead ends that the League traces down here "just because," until story's main villain, the Earth 3 Outsider, finally tips his hand with a plan that seems more complicated than necessary except for what the authors needed to fill six parts of the story. Given said hype surrounding Trinity War, I was surprised by some of the editorial difficulties revealed in the full collection. A couple of times it seems like one title doesn't know what another is doing, as when Deadman seems to go off with one faction of heroes but then shows up with another, with dialogue explaining away that he'd changed his mind. Trinity of Sin: Pandora #3 is placed, both in the collection and in DC's official checklist, before part five, Justice League Dark #23, but it actually takes place between parts five and six, creating a bit of confusion when the characters aren't where they're supposed to be (and Shazam looks considerably different, prematurely). As well, though I like the Phantom Stranger and Constantine series individually, in all their tie-in issues are less than necessary, with neither adding anything substantial to the story and both being easily skip-able (though again, not so unusual for events and their tie-ins of this type). One of my difficulties with Trinity War exterior to this collection has been the splitting of the various parts into the various individual trades; the parts of Trinity War feed into one another so closely that it seemed hard to make sense of the parts on their own. Ironically, in reading the full Trinity War collection, it became slightly easier to sense the individual titles' identities among the parts. Trinity War is structured better than a number of other crossovers in that it's a continuous story instead of each part being told from the different teams' perspectives (a fault, very often, of the Green Lantern events), but the various titles' identities do show through -- that the Justice League of America issues include a bit more of Steve Trevor and Amanda Waller, that the Dark issue focuses more on the captive Madame Xanadu, and so on. Reading Trinity War in parts split between three trades may not make sense the first time, but it might be easier after one full read of the whole thing. As I mentioned, Justice League: Trinity War reminds me of the Justice League crossover "Judgment Day" -- a bunch of battles with smaller enemies leading up to the main villain, and three Justice Leagues sparring and working together. "Judgment Day" isn't well known, but I remember it fondly, and the same is true for Trinity War; except for the story's final surprise, there's not much here to go down in history, but it was still an entertaining Justice League story. It's just a shame that whatever was intended by having Pandora appear in all those New 52 issues didn't come to fruition in this book; perhaps DC and the creative teams' hope was that if the story came close enough, the disparities wouldn't show, but they do. The strength or not of the Forever Evil story that follows will probably say much about how Trinity War is remembered. Reading an interview Ray Fawkes gave at the time the Pandora series was launched made me give up on the idea that they'd ever explain why she merged the DC, Vertigo and Wildstorm universes at the end of Flashpoint, or that there would be some in-story acknowledgement that a continuity reboot happened. If rumors are to be believed, Trinity War's plot went through many different versions and revisions before it was finally put to paper. At the end of the day, it became just a prelude to Forever Evil, but I was a bit impressed that Johns and Lemire told the story in a way that didn't contradict the FCBD preview that came out over a year before the actual crossover. As I mentioned and I think you'd agree, if Trinity War had been advertised simply as a prelude to Forever Evil (like "Countdown to Evil" or "Evil Rising" or something), this might be a different review. It's only because of how Pandora was hyped and then essentially dropped -- changing plans, as you said -- that made me feel this way. I, too, liked the way they tied in to the FCBD preview. The tie-in comes so late that you almost think maybe they weren't going to do it, then Batman grabs Green Lantern and it's "on," as it were. That was a good moment in the story, and indeed there were many good moments in the story; it's just the exterior issues that are the problem. Shagamu, what did Fawkes say about Pandora? I kind of assumed that since she had her own ongoing series they would wait to tie up her plot until that book got close to cancellation. Also, how much can you change the plot? The 3 justice leagues all thought they new best, and fought each other, seems like what the Trinity war was always meant to be? Unless it wasn't originally designed to be a FE prelude at all? I guess we don't know for sure, but given that Pandora combined the worlds at the end of Flashpoint, and given that she appeared in every New 52 #1 title, and given the extent to which Pandora was emphasized in the FCBD issue and etc., I think the general understanding was that Trinity War would deal with all of this. DC even released a promotional image that was supposed to appear in Pandora #1 that dealt with Pandora watching all the DC heroes, that didn't ultimately appear in the issue. So that's why I believe there was a change. Fawkes suggested that Pandora may not even know about her role in creating the New 52 universe, and might not even be the same person who did that anymore. I did some searching and actually found a lot more old articles where people were hyping answers to pandora which obviously never happened, so I'm more inclined to agree the story must have chopped and changed, but I'm not sure why. I was just keen to see the 3 leagues interact since they had all stayed pretty separate in the new 52, and was relatively unaware of how much Trinity of sin hype surrounded the story before release. @Shag -- Which, good on Fawkes if he can explain away Pandora's Flashpoint role by positing it wasn't the same Pandora, etc., but obviously that's a band-aid to cover over what was originally meant to happen versus what eventually did. I've just finished reading the story and I must say that I can see your point CE, the story itself is not bad ( perhaps a little forgettable) but unsatisfying due to the fact it is little more than a prelude. However, I do remember hearing Dan Didio on Fatman on Batman, where he said "next we have Trinity War, which is a lead in to our first major event" or something along those lines. I remember this being in about Feb 2013, so I was surprised your review talked about build up as much, perhaps after hearing this I ignored most of the official hype. I agree with you there CE, the story really could have used more of those characters and more answers to make it a more satisfying plot. I think, when you think about it, Trinity war is a great example of how the marketing for comics is all wrong. The fact we were disappointed with a story at all, especially when it is not actually a bad story, should have been seen by DC and they could have hyped it properly as a lead in instead, or given us what we expected. Don't sell it on the promise of answers and abandon the plot. That's annoyed me with Lobdells new 52 offerings too. It's also devalued the two Trinity of sin books too as they no longer have the importance they did before. I think after reflecting on the story for the last 24 hours I agree with your review more. I originally was happy with the story, but the more I thought, the less enjoyable it became because of all the missed opportunities. Well, my goal is never to rain on anyone's parade, but I did want to give an honest assessment of why it was the story disappointed me personally. Not a bad story for what it was. I think my disappointment in Trinity War mars my initial reactions to Forever Evil just a bit, but at the same time I'm eager to read Forever Evil 1) because I'm curious to see how the Justice Leagues get out of Trinity War's cliffhanger conclusion, and 2) Lord help me but I like the way David Finch draws villains. So I'm still in for Forever Evil, for sure. I'm actually a little more excited about the tie ins. Argus featuring Steve Trevor and Deathstroke, two of my fav characters, then rogues and arkham war are written by two of my fav writers at the moment. I suppose I'll probably be disappointed as these stories are tie ins and so will be limited in the story they can tell. Agree with you on Finch, I really loved his art in The Dark Knight because he could give so much personality and a sense of, well, evil to characters like scarecrow. I think the best explanation is: it's D.C. It seems as though long term planning is not a priority. Remember how the daemonite storyline was building in the Superman books and then was dropped without any mention at all? I think we can safely assume that what has been reported is true: Flashpoint was supposed to be a Flash story. D.C. decided to reboot. Flashpoint became the story that they used to reboot. They had a story that involved Pandora and that explained things but as time went on they lost interest in that and transitioned Trinity War as a setup to Forever Evil. Yeah, unfortunately you can't read trades just in the order they come out like monthly comics (and sometimes, you can't even do that with monthly comics!). Well I finally got a chance to read this trade, and I must say that I really liked it. I've never felt like Pandora was a major character to begin with, and I've never felt any hype against her or the Trinity of sins. I just thought they were promotional material that was expendable when it came out, so I went into this trade with no hype or expectations at all and totally loved it. If anything it made me really want to go back and buy some of the supernatural books from the New 52. >> If anything it made me really want to go back and buy some of the supernatural books from the New 52. I really liked the Phantom Stranger book by DiDio and then JM DeMatteis. The Pandora book is so-so (sometimes really good, sometimes not) but reading the first and second volumes helps explain some of Trinity War's ending reversals.